It KOGO At Night on Newsradio 600 KOGO. We’ve been talking about the college admissions scandal, and we talked about Felicity Huffman and Lori Laughlin who were in front of a judge today along with the fellow from San Diego. And we’ve got, what is it, 33 other people I think that are facing a judge over the college admissions cheating scandal. And one of my favorite jokes about this is that the admission scandal was wealthy people paying to try to get their children into elite colleges. Fantastic. 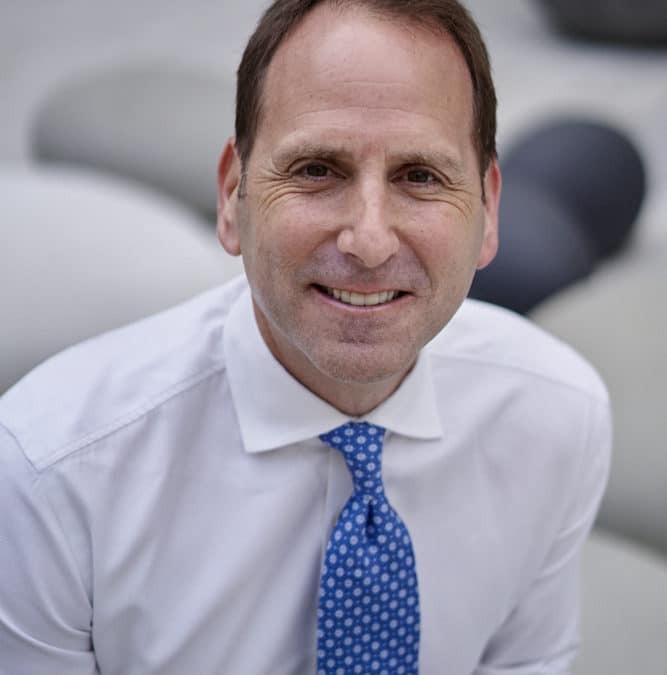 In the case of Lori Laughlin and Felicity Huffman and also this gentleman from San Diego, USC was the elite school that was the focus of their efforts. Speaker 1: But now the next step, what happens then if some of these individuals, and we don’t know how many or the severity of the punishment, but let’s just suppose that some of these individuals end up doing time? Judge says, “You have taken away opportunities from those people who worked very hard to earn those opportunities. You flaunted your wealth. You have done things that have hurt and torn at the fabric of society.” Just supposing a judge says something along those lines. Well, this is where some of these individuals may reach out to somebody like Justin Paperny. Justin Paperny is a prison consultant basically, and he joins us now. Justin, if you’re talking with one of these individuals, and the judge sentences them, what is the first thing they’re going to say, “Justin, what do I do?” What is the first thing that you tell them? Justin Paperny: Most of the initial questions have to do with what life is like in federal prison. And from there I pivot and try to help them understand that we shouldn’t be focused on federal prison today, but rather doing all we can to ensure they get the shortest possible prison sentence. And if they have broken the law, they should plead guilty, accept responsibility and focus on making amends to the victims. So those are my initial suggestions. 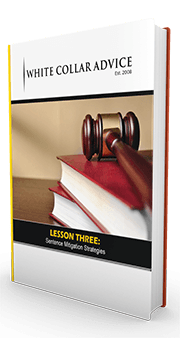 Defining success and then architecting a plan that will ensure they get the shortest possible sentence. Speaker 1: Does that sometimes put you at odds with the attorneys? Justin Paperny: It can in some cases. I’m grateful to get a lot of referrals from lawyers but in my case and in a number of cases, for example, it can drag on for weeks, months, in some cases more than a year. And a defendant can blow through hundreds of thousands of dollars, millions of dollars in legal fees. And then inevitably trying to plea agreement, or some defendants say, “Oh, we’re going to go to trial.” And on the eve of trial, they plead guilty, and these defendants are already in prison anyway. They’re just not getting credit for it. It’s on their mind 24 hours a day. Speaker 1: Justin Paperny is with me, and he is a, I guess what does, is there an official title, a prison consultant? Does that sound? Justin Paperny: Yeah, and when I was in federal prison. I regretted how I prepared. I interviewed other good men who regretted how they prepared for federal prison, and I pioneered this federal prison consulting industry and for more than 11 years, our company whitecoloradvice.com and prisonprofessors.com has helped hundreds of thousands of people prepare for prison life, through prison and beyond. So it was originated by my own experience in federal prison. Speaker 1: So Justin, let’s say we get through that process. You talk to that client. The clients says, “I need to get a plea deal. I want to have the best time possible,” and I don’t want to make it sound like we’re going to a vacation camp here, “but I want to have the best outcome possible, which means I understand I’m going to have to go do some time, but I don’t want to challenge the courts. I want to be respectful, and I want to get this started.” So once you do that, the individual is sentenced, then what? Justin Paperny: Then they begin to prepare to surrender it to the Federal Bureau of Prisons and move into this new twisted world of confinement. So we will spend hours understanding the rules of prison, both written and unwritten. We will spend time understanding how they will be perceived as a celebrity. We worship celebrities in this country, which means some inmates and guards may worship that celebrity prisoner. So we identify what their values are, getting home safely, quickly with their family strong. And to do that, we spend many hours architecting their prison routine and defining their goals. It does not have to be a wasted experience in prison. It can be incredibly productive as it was for me and our client. People may not think that, but it can frankly be a phenomenal experience. As crazy as that sounds. Speaker 1: Give me an example of, obviously with you, you came out, and you had this idea for a business. If we’re talking about these celebrities going in there, how do they make the best of this time and how do they use this time to better themselves? Justin Paperny: Oh, just like in life. They were successful by creating values, identifying them and faithfully pursuing them on a daily basis, whether it’s fitness, family, their network, education. All of those things are possible in prison. So I tell any defendant, defendants in this case, “If you go to prison, identify your values, fitness great, exercise. If it’s education, go to classes, read. If it’s growing your network, great. Write letters to your family, connect and grow. So it’s simply identifying values and pursuing them. You don’t stop that just because your warehoused in a federal prison. Speaker 1: So Justin Paperny is with me, he’s a prison consultant. Talk to me again about the celebrity aspect of this. You’re sort of worshiped in the outside when you go in, I’m sure there are going to be inmates that are in awe. There may be guards that are in awe, but at the same time can that also work against somebody? Are there those that suddenly want to challenge that individual? Justin Paperny: Without question, there are some inmates could care less. Other inmates will kiss-up in predictable sycophantic fashion, wanting to cozy up and help them and give them goodies and items to help them adjust. It would be the same way with guards, so they have to be aware of that. So my experience, whether you’re a celebrity or not a celebrity, is to avoid staff and do not spend time speaking with staff any more than you have to for myriad reasons. I could write a third book about it. I encourage them to be very careful about the friendships they form because iPhones, for example, are pervasive in prison. People smuggling in drugs and alcohol and Double-Doubles from in and out Burger. Those are all disciplinary infractions that could get you sent to the hole. In other words, the special housing unit, where you’re locked in a concrete bunker for 23 hours a day. Justin Paperny: So they have to understand, they have to pay attention to the friendships they form because they could form a friendship that first day with someone who turned out to be a real troublemaker. So yes, there will be more attention drawn on them because of their celebrity status. And it’s more the reason they need to invest the time to prepare properly. Speaker 1: What are some of the myths going in? If we watch OZ on HBO, it seems like the first time you walk in you’re going to be molested. If we watch Shawshank Redemption, it seems the guards are trying to work against you and turn you into a slave laborer. Give me some of the myths and let’s dispel some of those thoughts right now. Justin Paperny: Sure. I appreciate you asking. I like to debunk the myths that federal prison is a country club. A myth is that it’s a country club that because some of these camps don’t have fences or barbed wire that you’re not really confined. The reality is that you are told with whom you can share space. You are told what type of job you’re going to have. You have 10 phone minutes a day. You’re told when you can visit. Your mail is read. Your phone calls are recorded. Your emails are saved. You’re scrubbing toilets and showers in some cases, so because someone sees a tennis court or a soccer field, they presume that is a white collar country club, which it is not. Justin Paperny: When I was in federal prison, I walked into a shower and saw that a man had defecated. When I worked in the kitchen, I worked with a white supremacist who questioned the existence of the Holocaust. 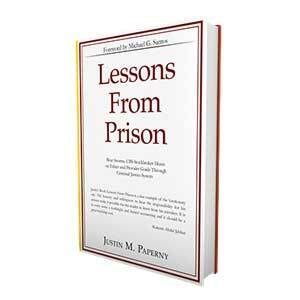 I wrote it in my book Lessons From Prison, which anyone can get for free on my website. So when I was in a country club, men weren’t dedicating in the showers, and I wasn’t playing golf with white supremacists. I think it’s important to understand what is and what is not a country club. Speaker 1: Why does it have that reputation for being a white collar country club prison? Justin Paperny: Because of that. Because you don’t see fences or barbed wire. You see tennis courts, you see a soccer field or a softball field. You see men in Khakis and a tee-shirt. You don’t see fences or barbed wire and people presume, “Oh, you’re going to a white collar country club for a little while.” Not understanding that 90% of the prisoners are not white color. Not understanding that there’ll be serving time with drug offenders, men who have been in prison 20, 30, 40 years, including spending time in the penitentiary. That you’re spending time with guards who, the reason I call them guards, is because I saw a lot of guarding. I don’t call them correctional officers because I didn’t see a whole lot of correcting. See you’re in a hopeless and miserable environment and you just have to summon the strength and will to say, “At some point, this experience is going to end and I got to work hard to create a new record.” But that’s why the tennis courts, people think, “Oh, it’s a country club.” It’s false. And I’d love to convey why it’s false, as I just did. Speaker 1: Justin Paperny is my guest He’s a federal prison consultant. Is it safe to say, Justin, that you’re the guy that Will Ferrell’s character should have called in the movie about adjusting to prison life? Speaker 1: Which, of course, was a comedy a couple of years back? But that’s basically what you do, right? Justin Paperny: Yeah. That’s right. Prison consulting, preparing good people who made some out of character mistakes for sentencing, for prison, life after prison. We have clients who have very successful businesses. Where we’ll help manage their business from prison and then when they come home they’ll be on probation. So yes, there was a lot on that movie I didn’t I agree with. I just don’t think they were very funny, but I did agree with, but essentially, yes. I would have been the federal prison consultant. I really created this industry because I wanted to help more people make better decisions than I did, and I’m grateful to have that opportunity. Speaker 1: That is so fascinating. All right, Justin Paperny, give me the website so that if people want to check out your book Lessons From Prison, and they want to find out more about you. Heaven forbid they’re in a situation where they need your services, but if they do, then we wanted to be able to find you. Where is it? Justin Paperny: Sure. So www.whitecollaradvice.com. 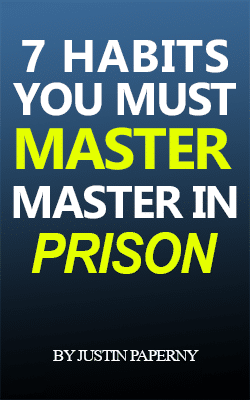 Anyone can go there, opt-in and get my book, Lessons From Prison, for free. I wrote the book the last five months of my federal prison term. Again, whitecollaradvice.com the book is free. Don’t send me any money. Simply invest the time to read it and you’ll be further along. Speaker 1: Justin Paperny, thanks for sitting in. It’s been a pleasure actually, very enlightening speaking with you. Thank you so much for your time. Justin Paperny: Thank you for the opportunity. Speaker 1: All right, best to you, and we’ll continue here. Just a few moments. It is KOGO at Night Newsradio 600 KOGO.